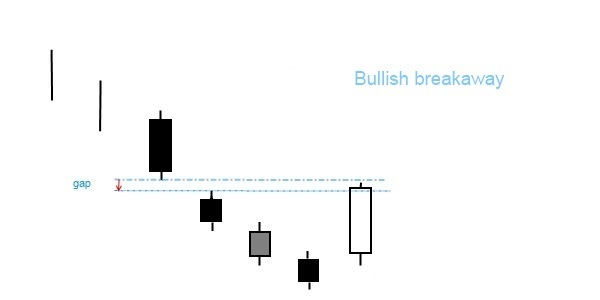 The bullish breakaway pattern consists of five candles. The first one is a long black candle that forms in a downtrend. The following three candles all continue in the same direction with lower closes. All the days in this pattern are black except for the third candle that can be either black or white. The fifth day is a long white day that closes inside the gap created by the 1st and 2nd days. The acceleration of the downtrend is slowing down, then the trend changes with an upward break-out. The gap is not filled so the reversal is weak and short-term. Bullish breakaway forms scarcely and may not be very reliable. It can be spotted during significant market impacts, e.g. when a remarkable event takes place and affects a stock.